Did you know January is National “Thank You” Month? How can something so easy to say … be so hard to do? At our deepest level, every human being has a craving to be appreciated. We all want to know that what we do makes a difference. We want to know even our very existence matters to someone. That need to be recognized or appreciated is not something bad. To some degree, it’s just a part of how every person is wired. Catch people doing something remarkable … and then recognize it! Don’t recognize “good” or “average” performance because it then makes your recognition meaningless. Look for the 3 E’s … Performance that was Excellent, Exceeded Expectations, or Excelled the team’s mission! Mix up your approach. Sometimes you may have a private conversation where you say “thank you.” Other times you may want to recognize them publicly or possibly even send a note card. Know your team member and how they prefer to be recognized. And, while you’re at it, make sure you cc their boss. If that’s you, drop a note in their personal file so you can refer back to it when it’s time to complete their annual performance review. When saying “thank you,” be specific. What did they do that made a difference? Being specific helps them better understand what it takes to “win again.” As long as that is clear, they will continue to strive for remarkable performance again and again and again! 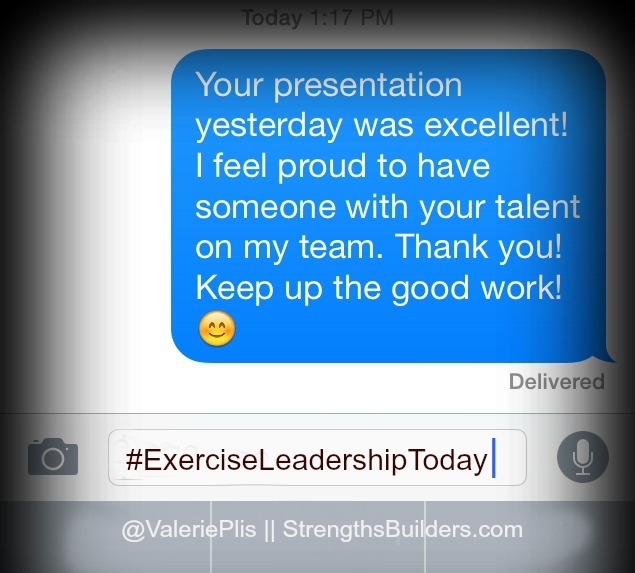 Exercising leadership and saying “Thank You” more often can be a game changer for your team! Don’t wait. Start today! Mark, I totally agree. If we could only grasp the powerful impact of a positive comment versus a negative one … and how those deposits can support or sabotage team performance … we would look to make positive deposits more often!